Someone near the taper excitedly shouts "all right, all right!" as Rock and Roll crashes into motion. The band is taking no prisoners as they race through a brutal Celebration Day. Page's guitar solo slashes and shreds through the frantic rhythm like a jagged razor blade. Plant tells the crowd "it's very nice to be back here, no messin' about" before introducing Over the Hills and Far Away. Jones leads Plant and Bonzo in a fantastic impromptu rendition of Georgia on My Mind while Page changes a broken string. Since I've Been Loving You is dramatic and powerful. The instrumental section during No Quarter features an excellent funky jam led by Page. Following The Rain Song, Plant announces "John Paul Jones was the Henry Mancini orchestra" adding "whatever happened to Henry Mancini?" He introduces Dazed and Confused by saying "during these five years, there's been all sorts of different colors, musically, that we've come across and put onto plastic... and this is one of the very first." Page's fingers get a bit sticky during the somewhat erratic guitar solo/workout section. The theramin freakout during Whole Lotta Love is preceded by a great jam on a heavy riff. The band drops the Boogie Chillen' section tonight, jumping directly into the coda as Plant repeatedly exclaims "ain't nothin' but a hound dog!" The band closes the show with a wildly cacophonous Communication Breakdown. The tape is a matrix of an excellent soundboard recording and a distant, noisy audience recording. Unfortunately, varying tape speeds result in the two going slightly out of synch occasionally. The effect isn't very noticeable for the most part, sometimes even enhancing the listening experience by providing a sort of false echo that gives the soundboard recording more of a full, atmospheric quality. 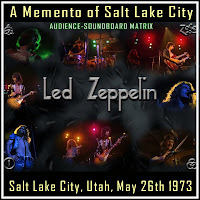 The effect is most noticeable during No Quarter and Stairway to Heaven, in which the separation becomes wide enough to make the tape a bit difficult to listen to.